You still have time to join a team for the Great Empire.Kred Food Fight! Any items you threw during the week will help your team. Whether you throw a lot, throw a little, or just collect food fight items, you can help your team win. Sign up to be assigned to a team. New players added to teams daily. Check out the bratwurst and rum we're throwing in honor of two special days: National Bratwurst Day and National Rum Day. The more you throw, the more your team benefits. Post often and widely to encourage more people to throw food items at YOU. The more items thrown at you throughout the event, the more points your team gets. Share social media posts on Twitter and Facebook. Sharing helps your team. SHARE THIS BLOG TO START! Use #empirekred hashtag. 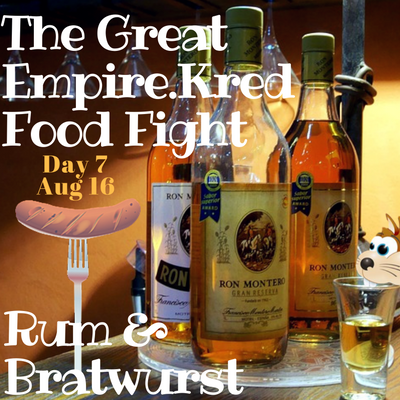 Have fun, connect with your team, and see if YOU can win the Great Empire.Kred Food Fight.